This object is a Flicker Photometer. Inside the semi-cylindrical box is a series of rough surfaced white plates that are placed at right angles, facing away from each other. These plates are attached to a wheel and can be rotated by turning the wheel. On each side of the box is a glass window and there is an adjustable eyepiece with a convex lens that looks through a circular opening and onto the white plates. The whole system is made of brass (except the glass windows and lens) and has a simple extendable stand. The Flicker Photometer is used to compare the luminosity of two light sources. Light from the first source enters through one of the windows and falls onto one of the white plates. Light from the second source enters the opposite window and falls on the second plate. When the wheel is turned the plates rotate and the user looking through the eyepiece sees flashes from both sources, one after the other. When the two sources of light have different luminance the user sees a flickering due to the rapid switch between bright and dim sources. When the two sources have the same luminance the flickering disappears. Because of the rapid flicker rate, the user can detect differences in the luminance of the sources but do not detect differences in the colours of the sources. This is extremely useful because it allows scientists to compare two light sources that are of different colors very accurately. When using the Flicker Photometer it is important to have the right flicker rate (the speed of the wheel turning). If the wheel is spun too fast the flicker cannot be detected but if it is too slow the user will not see a flicker but rather a colour change. Flicker Photometers are mainly used for heterochromatic (multicolor) photometry. Because Flicker Photometers like this one are simple to use and easy to transport, as well as being able to compare differently colored sources, they were suitable to use in streets or buildings to ensure the lighting was the correct brightness. 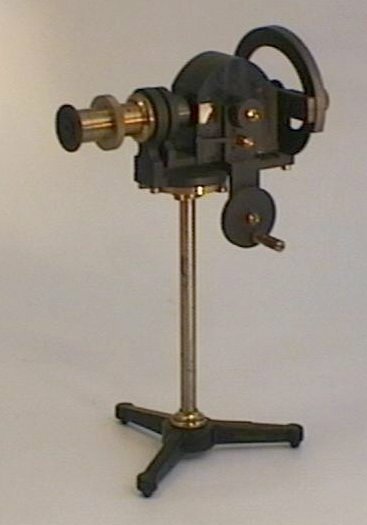 This Flicker Photometer was made by Max Kohl AG around 1912. The company, which was founded in 1876, designed and built a huge range of scientific, mechanical and electrical instruments which were sold to laboratories and universities throughout the world. During WW2, the factory, which was located on Andorfer St in Chemnitz, Germany, was destroyed by allied bombing. Flicker Photometry, J.S. Dow. Philosophical Magazine 1906 vol. 12 p.130. Optical Convention (1912), Catalogue of Optical and General Scientific Instruments, p.190-191. E. Grimshell (1933), A Textbook of Physics, Blackie and Son Ltd., London & Glasgow, p.25-28. R. Glazebrook (ed.) Dictionary of Applied Science, vol. 4 (1923), Macmillan Co. Ltd., London, p.410, 411, 453-458.